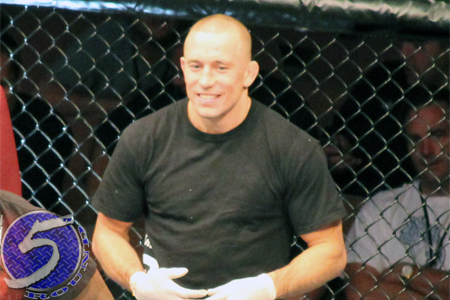 For someone who is quasi-retired and doesn’t have a fight coming up, former UFC welterweight champion Georges St-Pierre (pictured) sure still participates in some rigorous training. But back for what, exactly? “Tore my left ACL in training. Surgery in a few days. Rehab, pain, hard work, no shortcuts- I’ll soon be back at 100%. Thanks for the support,” St-Pierre posted on his Twitter account. St-Pierre had surgery on his right knee for a torn MCL back in October 2011. That procedure kept him out of action for 13 months. St-Pierre was the UFC’s most decorated welterweight champion when he vacated his title and abruptly walked away from the game this past December to “take a break.” UFC president Dana White said last month that he “knows for a fact” the 32-year-old will return to MMA. If that’s the case, tack on a lengthy rehab process to his comeback.